Design: Curved mouthpiece with jointed barrel in center and slight port for slight tongue relief. 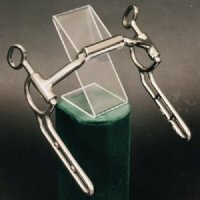 Usage/Solution: The Myler Mullen Barrel mouthpiece is a good choice for the intermediate horse. With the strength of the solid Mullen Mouth, the bit encourages the horse to break at the poll but keeps him from getting behind the bit and inverting. Also offers more tongue relief than the EM 32 and is a good choice for an older horse that is light in the mouth but has been in a straight bar a good portion of their lives or a young horse that has advanced beyond the EM 04 or EM 05. Good for driving in singles, team, or multiples. Also available with bushing.